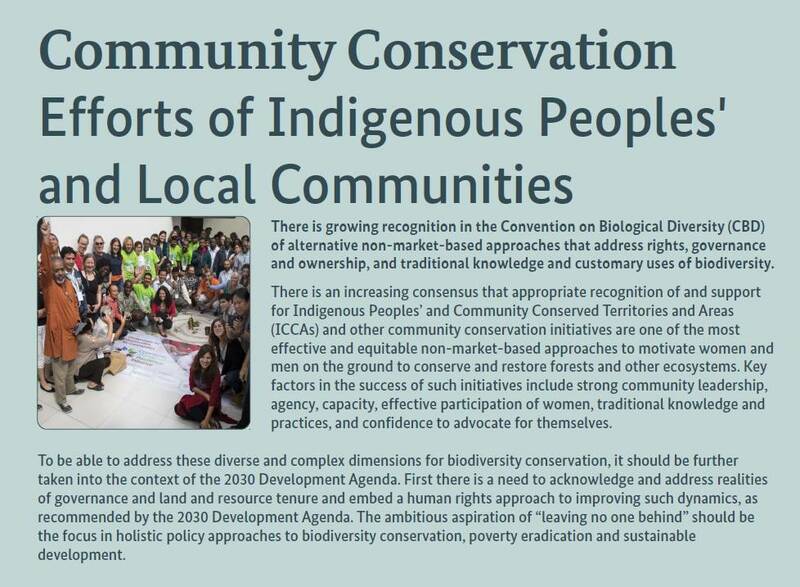 There is growing recognition in the Convention on BiologicalDiversity (CBD) of alternative non-market-based approaches that address rights,governance and ownership,and traditionalknowledge and customary uses of biodiversity. There is an increasing consensus that appropriate recognition of and support for Indigenous Peoples’ and Community Conserved Territories and Areas (ICCAs) and other community conservation initiatives are one of the most effective and equitable non-market-based approaches to motivate women and men on the ground to conserve and restore forests and other ecosystems. Key factors in the success ofsuch initiatives include strong community leadership, agency,capacity,effective participation ofwomen,traditional knowledge and practices, and confidence to advocate for themselves. To be able to address these diverse and complex dimensions for biodiversity conservation, it should be further taken into the context of the 2030 Development Agenda. First there is a need to acknowledge and address realities of governance and land and resource tenure and embed a human rights approach to improving such dynamics, as recommended by the 2030 Development Agenda. The ambitious aspiration of“leaving no one behind” should be the focus in holistic policy approaches to biodiversity conservation, poverty eradication and sustainable development. See and download the poster here.